So! You've joined Steelgrasp Brigade and downloaded DiceMaster! Now what? This guide will help you out if your just starting out or feel lost as to what the hell you gotten yourself into! Don't worry if you are having trouble, be sure to ask a DiceMaster officer to help! Your first question is probably; "How do I move it?!" Not to worry, the frame can be moved around your UI by dragging the hidden grey anchor point beneath the center of each frame. While we are at it, lets add some Health to that bar. Steelgrasp Brigade events utilize 8 Health points to start. Just simply shift+click on the hearts to add more. Left click adds while right clicking subtracts. This helps you keep track of how much damage your character takes! Another important role in our system is Charges. Right click on your DiceMaster mini-map icon to bring up the Addons Interface menu. A) Right click on your DiceMaster mini-map icon to bring up the Addons Interface menu. Click on the empty box next to Enable Charges. B) A new box within the Interface menu, called Charges, should appear. Make sure to slide the dial to 5. Once you have your five, you can change the color if you wish. But be sure to click on the Charges to fill them in. We use these for Abilities. This will be explained further down. 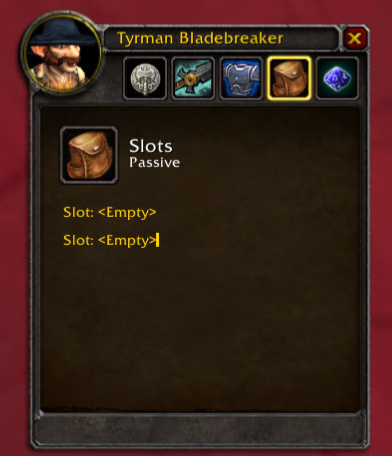 Now that you have your Health and Charges, lets make your first trait! Everyone starts with a Class Trait. This trait helps our Dungeon Masters (DM) to determine what sort of roll your character is aiming for. Once you have determined your Class, we can get to work on setting it up. Click on the Trait Editor Button (The book) and it will bring up the Trait Editor menu. 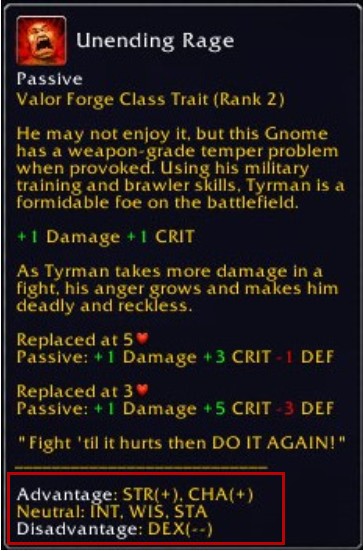 Ability: Taunt: You may taunt your target, forcing them to focus on you! Taunt difficulty depends on the target's power. Also gain +3 Critical Block against the taunted target for one round. Passive: Healer: You may heal during and out of combat. Passive: Companion: You and your companion roll separately to Attack. Your health and companion is linked; If your companion is harmed and fail a defensive roll, your health will decrease. Your second and third trait help make your rolls more unique, here is a breakdown to what each stat does to help you! Attack (ATK): Increases your chance to hit during your combat turn. Crit: Increases your natural critical threshold. Defense (DEF): Increases your chance to block during an enemy turn. Healing: Increases your chance for a better heal roll during your turn. 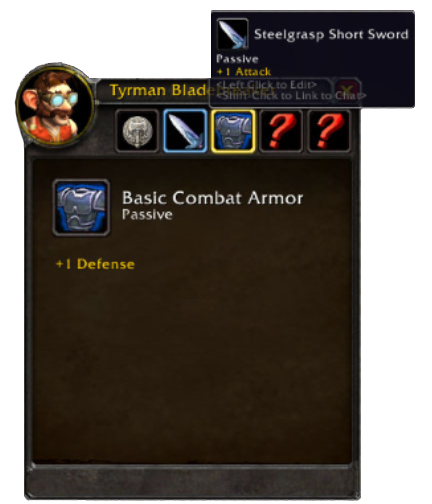 Steelgrasp Combat Armor: "Be it plate, mail, leather, or cloth, armor made by Steelgrasp craftsmen and women is made well indeed." Steelgrasp Armament: Your choice of a stock weapon! Sturdy and trusty! Passive: Allows for mounted combat while riding this mount. First-Aid Kit: A handy first-aide kit usable by anyone. Passive: Field-Medic: You may heal out of combat! This also works for his defensive rolls when he is attacked thanks to his +1 in Def! Be sure to keep an eye out for Valor Forge events on the calendar to upgrade your Traits or ask a Forge Father/Mother for more information! Great! You now have a basic setup for combat events! If you havn't already, your probably wondering what those Charges are for? Charges are the unique resource system players use with their Ability traits. Abilities, or actives, are special moves you can use to help in combat situations. Everyone starts at each event with 5 Charges to spend on Abilities they may have. Most Abilities cost 1 Charge unless specified. For more information, please check out the Traits and Abilities guide! If the player doesn’t have any, they may also spend Charges to gain +2 ATK per Charge for that turn (If they wish, they may spend all 5 of their Charges to gain +10 ATK!). Also, unlike other abilities, you can spend the Charges AFTER your roll! However, once the Charges are spent you cannot regain them for the entire event unless determined at the DM's discretion, special abilities, and/or crafted consumables. As we use the system in our events, items will drop! Most items that are carried are Consumables (One time uses). Basic Consumables could be Health Potions that heal +1 HP or even explosives that deal an AoE damage! You can also craft your own! Check out the Crafting Guide! Not everything is about bloodshed, you can talk your way or sneak past those enemies just as well! A non-combat roll is used for situations outside of combat. Stamina - Being able to eat a bad tomato. Disadvantage entails the same situation, except the player takes the smaller of the resulting numbers. If you have a double positive or negative, you would roll three times and choose the higher or lower number!